Mike R., one of my readers! In the background, you can see a rough leg held in my Moxon vise on the bench. Day 3 of the New England Home Show was the longest, 10AM-9PM. It was also by far the busiest and most crowded, since it was Saturday. I gave many repeated demonstrations and walkthroughs of the process making my carbriole legs, and let a number of people try the tools. A few walked away with a definite gleam in their eye. After struggling a bit with the clamping setup on my portable bench the previous two days when sawing out the straight segments of the curves, I brought in my Moxon vise. That made for good secure work holding in different orientations. I had been thinking I should add a face vise to this bench, but the Moxon took care of it. It's modularity and portability provide a better benefit. While heavy, it can be carried around separately from the bench. An interesting thing happened. Pictured above is Mike R. He came by with a buddy and was very interested, looking things over, watching my demonstration. We probably talked and went over things for 10 minutes. I finally showed him the SAPFM brochure and offered my card with the blog on it. He looked at it and said, "You're Steve Branam? I read your blog all the time!". Wow, that's cool! So I had to get his picture. It happened again when a gentleman stopped to watch with his son. We were talking about things and going over the process, and he saw the Guild Of New Hampshire Craftsmen logo on my sign. He said, "I see you have the Guild logo there, I'm a new member." Then he looked again and saw my blog logo and said, "And you're the reason I joined!". Turned out he had emailed me in the past and I had recommended he look into the guild. There were a couple more people like that. The last one was a fellow who was looking things over very closely in the booth as I worked. I looked up and said hi and asked if he had any questions, and he said, "I'm just looking at all the things you show building in your blog." All of this is of course very satisfying. I love to get comments and emails, and now the opportunity to meet people in person, and see that I've given them some genuinely useful information. 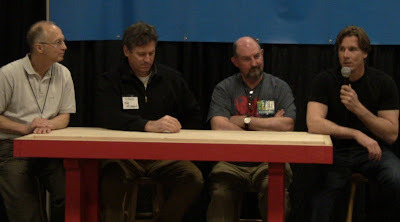 In the afternoon, there was a very interesting panel discussion with some of the real pros at the WoodExpo. In addition to Tommy Mac, the panel consisted of Glen Guarino, Tom McLaughlin, and Terry Moore. These guys have long experience in the custom furniture business. They aren't competing with the furniture stores you see on TV. They're doing high-end commission work selling for thousands or tens of thousands of dollars. 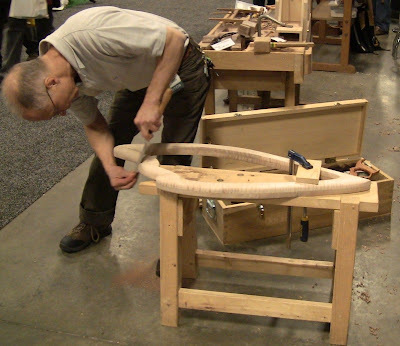 Glen Guarino is a world-renowned sculptural furniture maker, while Tom McLaughlin and Terry Moore are members of the New Hampshire Furniture Masters Association; membership is by invitation only. These are all the kind of furniture makers we aspire to be. The topic of discussion was the business of connecting buyers and makers of custom furniture, led by prepared questions from Scott Oja. As a hobbyist, I found it very interesting to hear the wisdom of people who have been successful for decades. When you talk to them individually, they are all the nicest guys, happy to talk shop and share information. They are the cream of the crop, not only in furniture making skills, but as businessmen in a select client-driven field, where you live and die by your reputation. They have a strong ethos of craftsmanship, service, and integrity. The opportunity to mix with them is one of the real benefits of society and guild membership and participation in shows. From left, Glen Guarino, Tom McLaughlin, Terry Moore, and Tommy MacDonald. 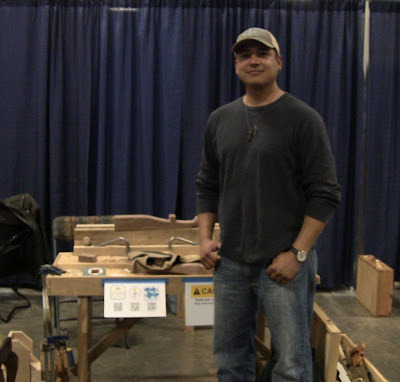 Glen Guarino stopped by and we talked about sculpting wood and the tools. He saw my Gramercy Tools rasp and asked how I liked it. I told him I loved it, but had no experience with other good rasps to compare. I offered to let him try it for himself, so he pulled out a mirror frame that he's in the process of shaping, secured it to my sawbench, and went to work. He liked it. So I think that speaks very highly of them, from someone who makes a living with rasp in hand. Glen Guarino testing my Gramercy Tools rasp. Today is the last day of the show. By now I've actually completed most of the shaping of four legs. Demonstrating means a lot of stop and start, pulling things out to show people. The two questions I get most frequently are how long does it take to make a leg, and how do I get them all alike? The first answer is that it's hard to say. The foot stool was my first ever attempt at cabriole legs by any method, so I was doing a lot of learning as I was going, sorting out the tools and the process, figuring out how to improve my efficiency. These legs I'm demonstrating are only my second set, and that's while talking to people and letting them try the tools. The whole stool took me about 40 hours, which is ridiculously long for such a small piece. I figure I can cut that down to 20 hours after a little more experience. I do have the process of sawing out the rough shape with rip saw and bow saw pretty well refined, though I was driving Mickey Callahan crazy with the slow speed of the bow saw and its fine teeth. He said, "Steve, we have to get you a piece of bandsaw blade with faster teeth!" The second answer is that I don't. While the legs need to be consistent, there's no need for absolute perfection. If you want that, make them with a CNC robot. But for handmade work, reasonable perfection is sufficient. Even on the highest quality work, no two legs are ever perfectly alike. Once you separate them and build them into a piece of furniture, with the different sight lines and perspectives, you never see the difference unless there's some gross defect. Reasonable perfection means you'd have to get down on the floor with a caliper to detect the differences.